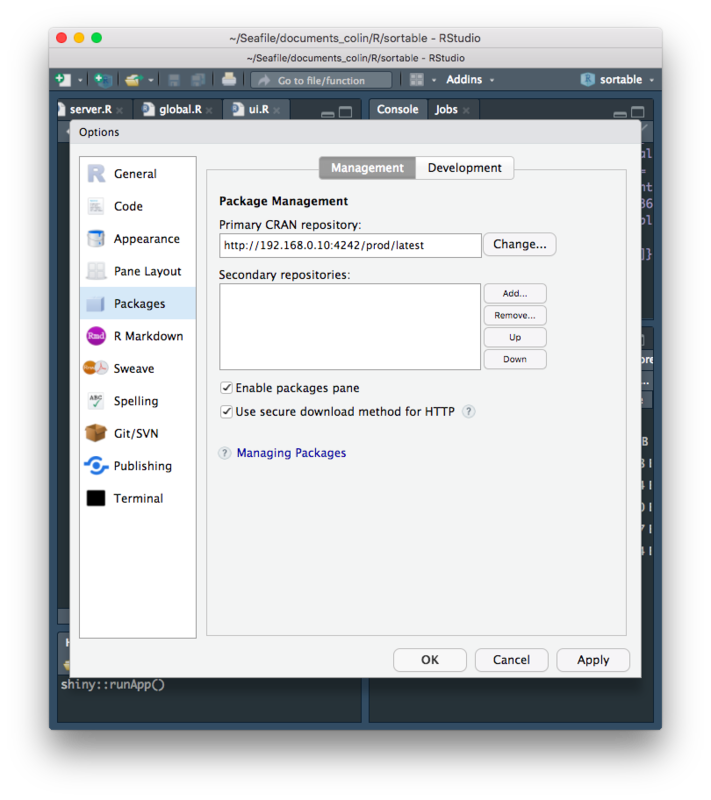 Managing packages in production is a lot of work: you have to juggle between versions, internal packages, CRAN updates, Bioconductor, GitHub sources… Let’s have a look into RStudio Package Manager, one of the tools available that helps you dealing with this. 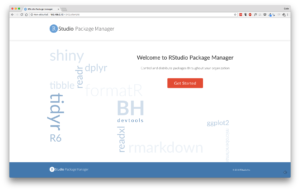 RStudio Package Manager (or RSPM for short) is a solution designed to help you to deal with the installation of packages in your organisation. 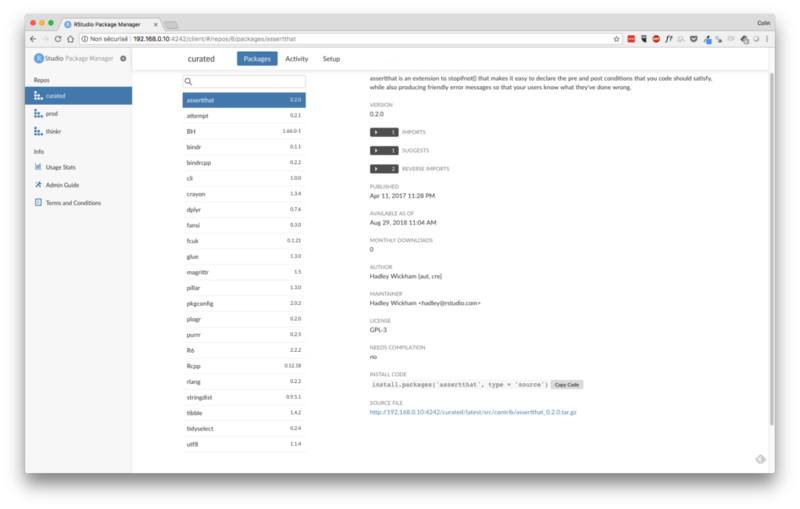 Wether you need to make available to your team the whole CRAN through a proxy, a selection of the CRAN, GitHub packages, internal packages, etc, you can use RSPM as a central point for managing that. It can also be useful if you have an network connection which is handled through a proxy, as RPSM can be configured to work with a proxy. 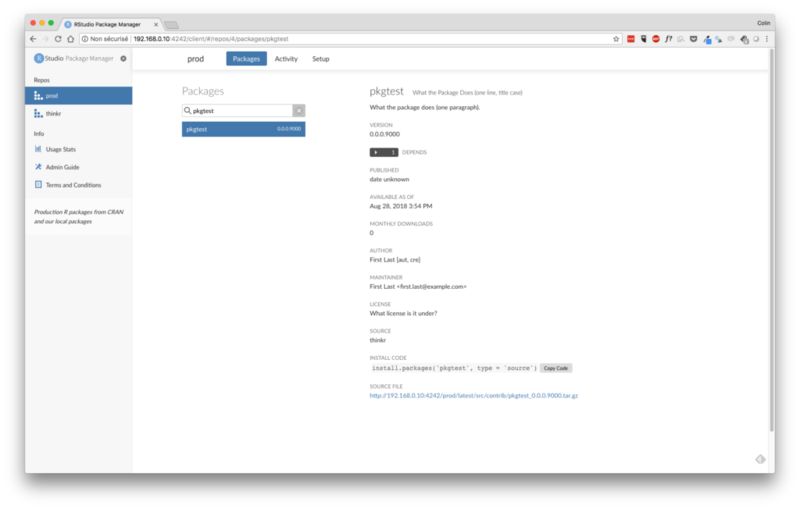 You’ll then have an internal access to a specific package repository. RSPM is available for trial for 45 days, you can get it on RStudio Package Manager. You can install it on Red Hat, CentOS, SUSE and Ubuntu (See here for the precise specs). RSPM is structured in repos and sources. A repository is a collection of available packages, which are gathered from one or more sources (see below for what sources are). Roughly, what this does is creating a RAN structure (see Dockerise and deploy your own R Archive Repo for more info about a repo structure). 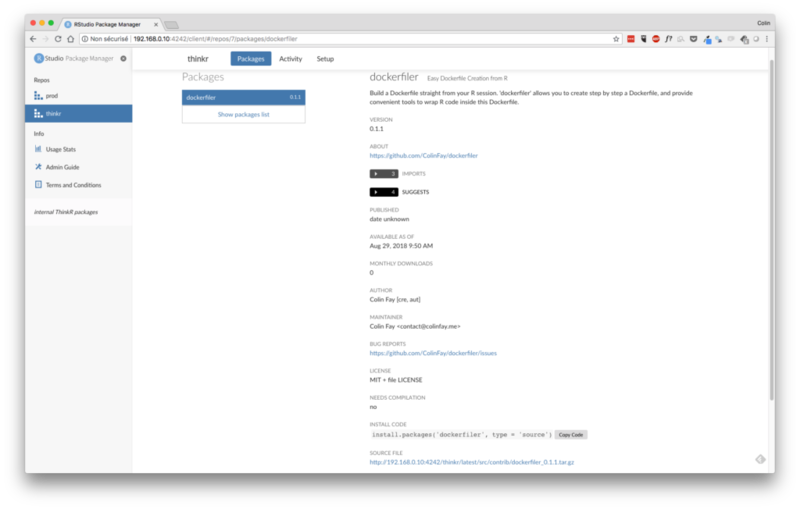 And archives are at http://<server>/<repo>/latest/src/contrib/archive/package/dockerfiler_0.0.0.9000.tar.gz. In an enterprise context, it’s not always easy to give access to the whole CRAN, for a variety of reasons (but mainly for security issues, as IT wants to control what a user installs on a machine). RStudio Package Manager allows you to do exactly that. 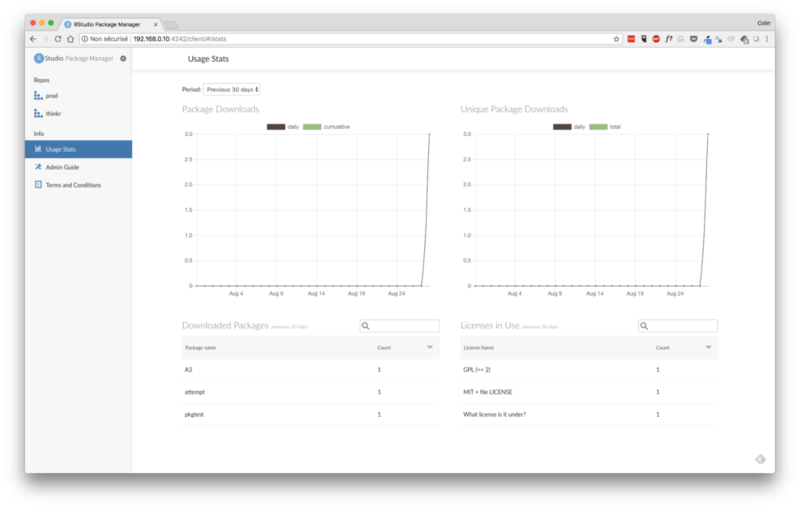 You can select a subset of CRAN packages that will be available. You can produce an output of the packages you want to make available. 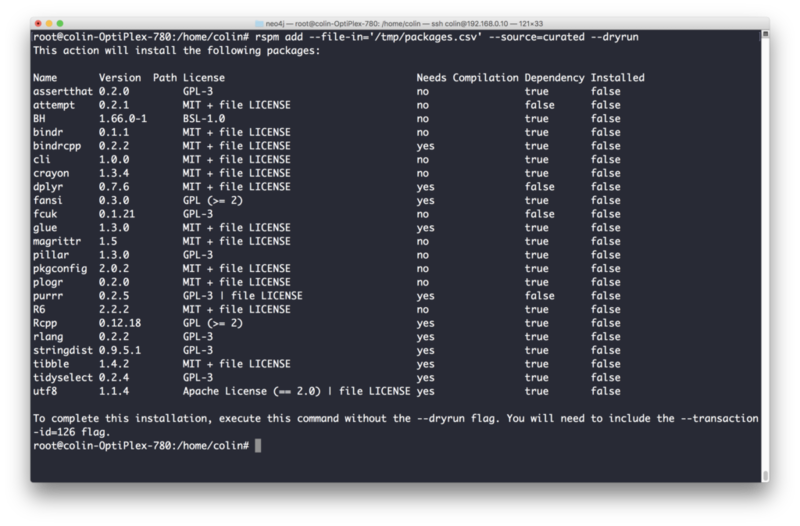 This output contains the info about the packages and all their dependencies, with information about compilation or licence. Once you have this subset, you can put the add “on hold”, i.e you’ll send the output of the previous command (available also in csv, not only as a console output), to your manager and/or IT department and ask for validation. Let’s assume you do this on the 1st of September. Bureaucracy being what it is, you might get a validation 15 days later. The bad news is, open source being what it is, packages might have been updated in the meantime. Well, the good news is that if you now upload the selection you have put on hold, it will install the package at the exact state it was when you created the list. If once approved and uploaded, you are requested to add a new package, it will also be added as the version it was on the 1st of September. And yes, of course, this repo can always be updated to the newest date. Ok, now what? How can I access packages on the RSPM in R? (Of course, it can be set in ~/.Rprofile). Next Post: Data visualisation pitfalls: how to avoid barbarplots ?